Join us for LOOP for Literacy! 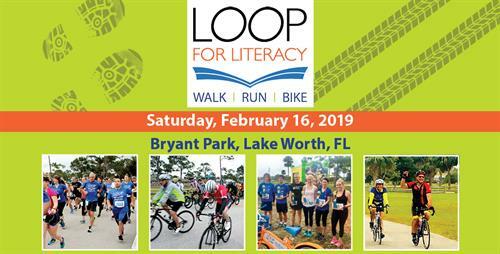 Gather a team of colleagues, family, friends or participate as an individual to actively support literacy in the ninth annual LOOP for Literacy. This run/walk and roadside cycling event includes refreshments, awards and prizes. Activities are planned for all ages and every child registered will receive a book. AccuChip Timing, awards and refreshments. Every partipant will receive a finisher medal and a race Tech Shirt. When you register to participate, fundraise and spread the word to fellow athletes, you help to ensure that children and adults gain the literacy skills they need to succeed in school, work and life. The 24-mile ride begins in the park at 7:00 am and loops back to the park. Helmet is required for all cyclists. Bike: Roadside Ride: The 24-mile ride begins in the park at 7:00 a.m., ventures onto North Flagler Drive and loops back to the park. The ride features a stop halfway at Manatee Lagoon. This is a family-friendly, SAG-supported ride thanks to Bill Bone Bike Law and the LC Tri Shop. 5K USATF Certified Run/Walk: Runners start at 8:00 am and Walkers start at 8:05 am. Kids 1 Mile Fun Run: (12 years and under) Starts at 8:45 am. Kids 100 Yard Dash: (7 years and under) Starts at 9:00 am.